Busy day today and I spent the first half wearing very unattractive tracksuit bottoms & trainers for a trip to Ikea & a physio appointment so I'm just sharing my second half outfit. 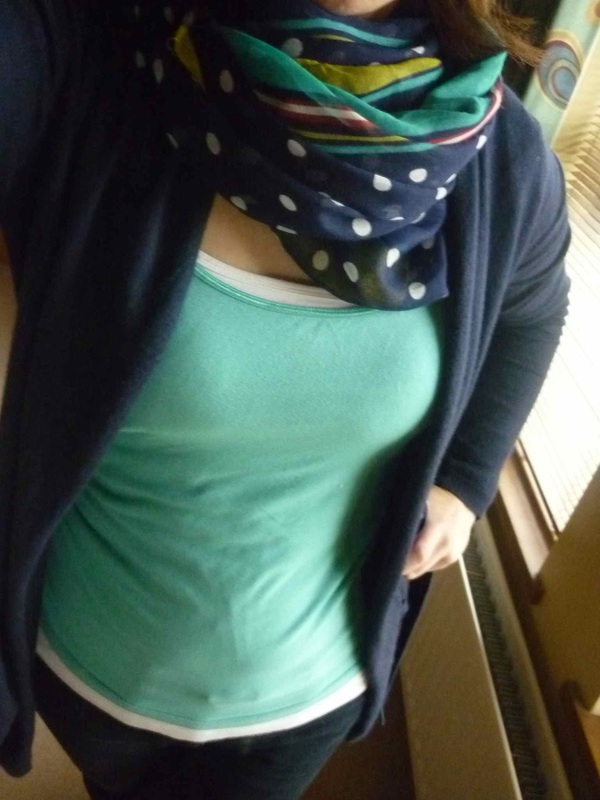 I've got a spotty & stripy scarf I picked up on eBay for £6.50. Love the colours on this - check out the link for other colour ways. 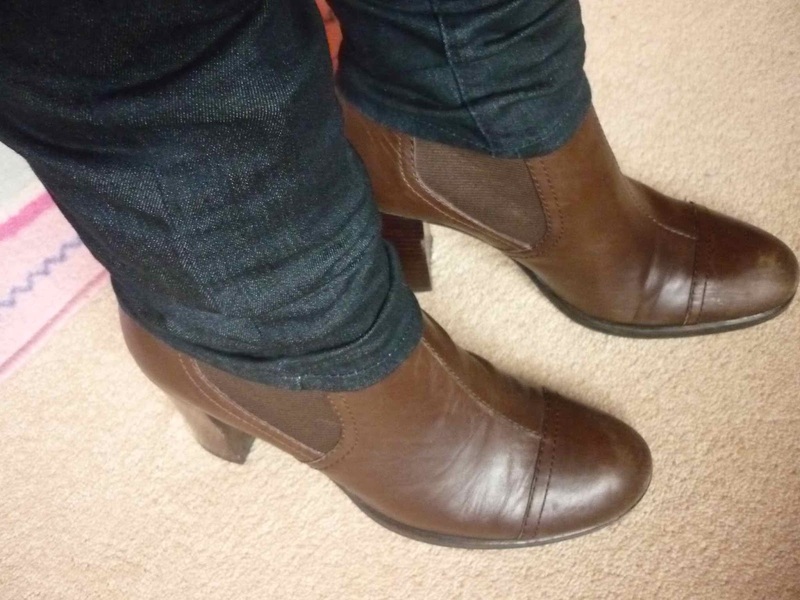 These brown boots were a gift from my shoe-loving sister. They were too small for her so I was the lucky recipient! They are Marco Polo boots she picked up in TK Maxx (even better than me at spotting a bargain. Proof that it's in the genes!) 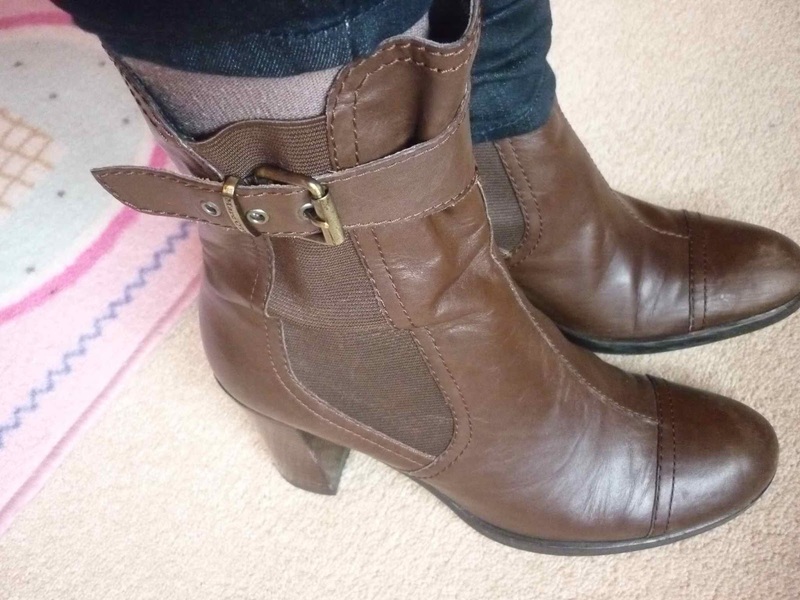 These boots are longer than they look in this first picture..
...but I like to wear them with my H&M skinny jeans over. And, if you're not a fan of wearing your scarf up around your neck, here's a nice alternative. 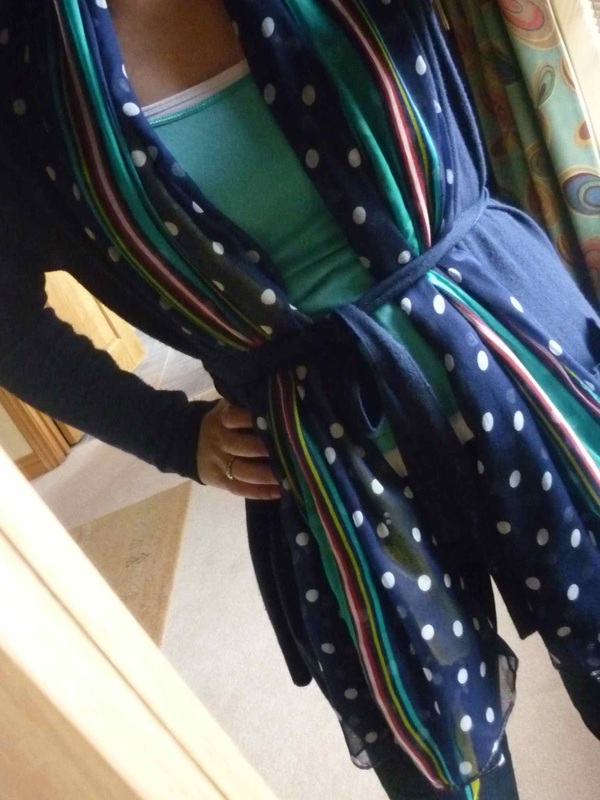 My cardigan has a belt but you can also use a skinny belt for the same effect. This works too with a belted coat. So why the physio? My favourite exercise used to involve running away from my kids for about 60 minutes three times a week. But I was stopped in my tracks late last year ago when a back issue caused referred nerve pain down my left leg. Hoping some physio will help with this. Today's physio was followed by a trip to Ikea - the best place to spend a cold and wet day in Belfast! We had a bargain lunch while watching the planes take off and land at City Airport- keeping both Dad and the kids happy! That scarf is really cute. I love scarves! I agree, the scarf is fab and I love the way you're wearing it, what a clever idea! I love how your blog doesn't make me feel like I need to spend lots of money, it just gives me ideas of ways to style the items I already own so thank you!